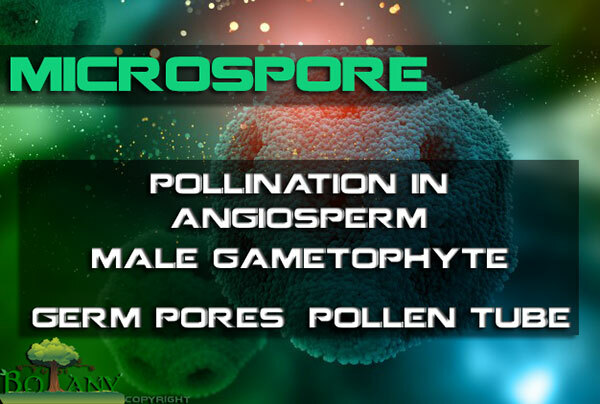 Microspore in angiosperm is a unicellular, uninucleate structure, possessing two coats, the outer exine and the inner Intine and contains a large central nucleus and dense cytoplasm. The exine is thick, cuticularized and tough layer and it is often provided with spinous outgrowths, warts or reticulations and sometimes smooth. The intine is thin, delicate, cellulosic layer lying next to exine. The exine possesses one or more thin places called germ Pores through which the pollen tube grows. The microspore germinates on a stigma and form a long tube known as Pollen tube which transverse the style and reach embryo sac. The intine, isthin , delicate, cellulosic layer lying next to exine. The microspore (pollen grain) is the first cell of the male gametophyte, and is haploid. Germination of the microspore starts while it is still in the pollen sac. The nucleus is shifted to periphery due to the development of a central vacuole. First division results in the formation of a generative nucleus and a vegetative nucleus. The generative nucleus along with some of the cytoplasm is delimited from the rest of the cytoplasm by the formation of a membrane and forms the Generative Cell, while the remaining part is the Vegetative or Tube Cell. The nuclei of the generative and vegetative cells differ in size, structure and in staining qualities. the nucleus of the vegetative cell is with a prominent nucleolus, the cytoplasm is rich in RNA and poor in DNA. Starch and fats are the conspicuous substances present as food. On the other hand, the nucleus of the generative cell has a small nucleolus, the cytoplasm is poor in RNA (less strained), rich in DNA and poor in proteins. Finally, the generative cell loses its contact with the sore wall and is shifted into the vegetative cell, where it may lie in any part of it. The generative cell is generally biconvex but in some cases, it is elongated. Generally, the microspores are shed from the microsporangium in two-celled stage. 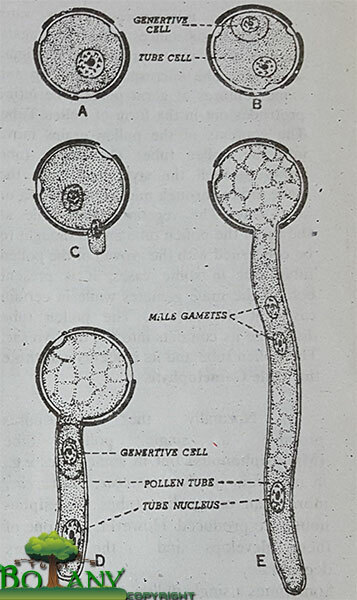 The generative cell divides to produce two Male Gametes. In majority of the cases, the generative cell divides after pollination. The transfer of microspore (pollen grain) from the anther to the stigma is called pollination. The pollination process is of two types; self pollination and cross pollination. Self Pollination Definition: The transfer of microspores (pollens) from the anther of the flower to the stigma of the same flower is called self pollination. Cross Pollination Definition: The transfer of the microspores from the anther of a flower to the stigma of another flower. The pollination is brought about through various agencies like wind by insects, or by water. The pollination process is carried out by three agents. These agents are also called pollinators. Anemophilous: Pollination carried out by wind. Entomophilous: Pollination carried out by insects. Hydrophilous: Pollination carried out by water. The stigma in different flowers are variously modified to receive the microspores. The surface of the stigma is usually papillate and glandular. The microspores are lodged among these papillae where they germinate and produce pollen tube. The microspores absorb water and other substances such as sugars, organic acid etc., secreted by the stigma and style. The microspores swell up and exine ruptures at germ pores. The intine protrudes in the form of Pollen tube. The contents of the pollen grains move into the pollen tube. 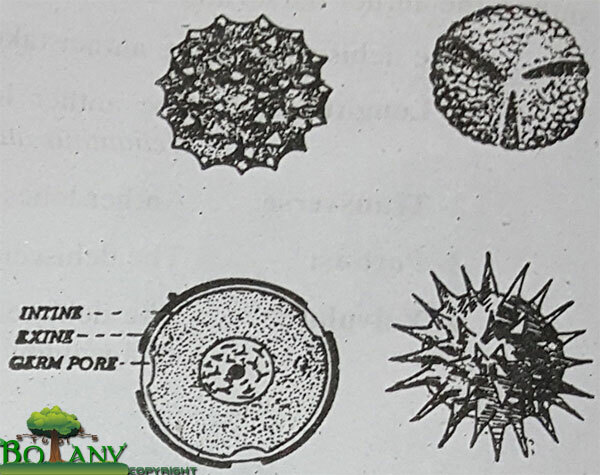 The pollen tube grows through the style and enter the ovule either through micropyle, chalaza or side – ways. The vegetative nucleus lies at the tip of the pollen tube and is thought to be concerned with the growth of the pollen tube. But in some cases, it is present behind the male gametes while in certain cases, it degenerates. The pollen tube discharge its contents into the embryo sac. 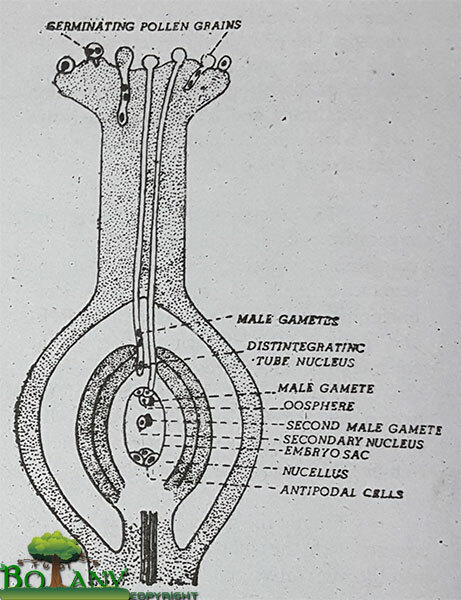 The pollen tube and its contents constitute the Male Gametophyte. Normally the microspores produce a single pollen tube (Monosiphonous) but in some cases e.g., in members of Cucurbitacae, Malvaceae, more Than one pollen tubes (Polysiphonous) are produced. However, only one of them develops and the others degenerate. Sometimes a single pollen tube may branch. The contents of the pollen tube pass to tip of one of the branches while the others abort, e.g., in Cucurbita pepo. The entry of pollen tube through the micropyle is considered as the normal process and is called Porogamy. This is found in the majority of the cases. In certain cases, the pollen tube makes its entry by penetrating the chalazal tissue, such entry is termed as Basigamy or Chalazogamy. In certain cases, the pollen tube enters the ovule from the side of the ovule by penetrating the integumental tissue. This entry is called Mesogamy.